The Chabad Center of Sudbury was established in the beginning of 2006 to respond to the growing needs of the Jewish Community of Sudbury and some of the surrounding towns including Marlborough, Hudson, and Lincoln. The Chabad Center of Sudbury is known for its unique and exciting approach to Judaism that makes it accessible, fun and meaningful to everyone regardless of background, affiliation or any other circumstances. Since our establishment we have seen unbelievable success in reaching into the community and have established ourselves as a premier Jewish Institution in Sudbury. The wide range of programs we offer are geared to all ages and affiliations. Our programs include year round Holiday Educational Programs, Adult Education Courses, Religious Services, children's programs and much more. Come and see for yourselves any of our wonderful programs or services and you will be sure to feel right at home. Born and raised in London, England, received education in Rabbinical Schools in London, UK, Montreal, Canada, & Brooklyn, NY. Received Rabbinical ordination in 2001 in New York from the Chief Rabbi of the Israeli Chabad Rabbinate. Rabbi Freeman spent time working in Jewish Communities in Venezuela, Cuba and of course the United States. Prior to establishing the Chabad Center of Sudbury Rabbi Freeman served as the Rabbi of the Greystone Jewish Center in Yonkers, NY. Raised and educated in Los Angeles, California, spent a year in a Jewish College in Jerusalem, Israel which was followed by a year in the Beis Rivkah Teachers Seminary in New York. Mrs. Freeman holds a Bachelor of Arts from the Thomas Edison University in New Jersey. Mrs. Freeman has extensive experience in community work, programs and events coordinating, teaching, and educational programs for both youth and adults. The Chabad Center of Sudbury is dedicated to providing the joys of Judaism to the entire Jewish community in the Sudbury area and strengthening Jewish awareness, pride and continuity for our present and future generations. We provide a venue for Judaism in a traditional yet contemporary and relevant manner that will enhance the Jewish experience for all who participate in our programs, events and informal encounters. The Chabad Center serves every individual or family that walks through our doors. We are open to Jews of every shade, stream, or color, whether they consider themselves secular, reform, conservative, traditional, or undecided. Each individual and family defines the level of involvement that fulfills their own needs. The Chabad Center fulfills its mission by providing unique Jewish experiences that touch and inspire their participants and by creating exciting hands-on programs for children and families that bring tradition alive. Our full range of services includes Shabbat experiences, Jewish New Year Fair, adult education, children's’ programming and outreach support and counseling services for those in need. We are dedicated to inclusiveness as we provide traditional Judaism in a very open and accepting way that permeates all our programs and services. We create an environment that allows everyone to feel comfortable and connect with their Judaism . No matter how people define their relationship to their Jewishness, be it reform, conservative, agnostic, or traditional, here at Chabad Center the labels are irrelevant. Each and every individual’s meaning of their Jewishness is respected as our Center thrives on the common ground of our Judaism itself. · We believe Judaism should be experienced in a joyful, relevant and meaningful manner. · We respect every individual for who they are, and don’t try and impose any particular practice of Judaism on anyone. We believe that diversity enriches our Jewish community. · We are there for everyone regardless of religious observance or beliefs, affiliation or lack of it. · We believe in nurturing each individual’s journey of self-examination and making meaning of their Jewishness. 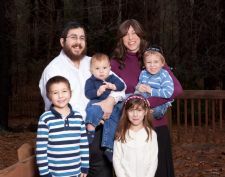 · Involvement in Chabad Center is open to everyone regardless of one's financial means. · Our shared history and common bonds as a Jewish community are an eternal source of connectedness, strength and support. The Chabad Center is dedicated to sustaining our Jewish communal life and its inspiration and empowerment for us all. With over 2,700 international branches, Chabad-Lubavitch is one of the largest Jewish organizations in the world today. “Chabad” is a Hebrew acronym for “Wisdom, Understanding and Knowledge,” and Lubavitch is the town in White Russia where the movement was based for more than a century. The word “Lubavitch” means “brotherly love,” which is emblematic of the love and dedication that characterizes Chabad-Lubavitch and its emissaries. Founded in 1772 by Rabbi Schneur Zalman of Liadi, Chabad promotes the mystical, traditional, legal and social principles of the Torah — while using modern methods and technology for education, community outreach, youth programs, crisis intervention, and other social services. Chabad is always innovating new approaches for its educational and community services, but keeps them rooted in traditional Jewish values. Around the globe, more than 4,600 of the Rebbe’s emissaries and a workforce of over 20,000 continue his mission to create a world of goodness, kindness and G‑dliness.